North Suburban Synagogue Beth El, 1175 Sheridan Rd. 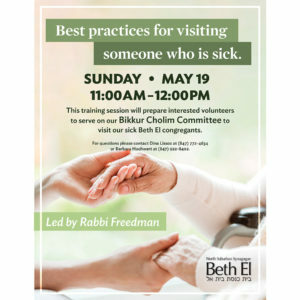 A training session for interested volunteers to visit our sick Beth El congregants and be part of our Bikkur Cholim Committee. Contact Dina Lissos at (847) 772-4634 or Barbara Hochwert at (847) 922-8402 if interested. This session will be led by Rabbi Alex Freedman.